SCVHistory.com | Lebec | Hotel Lebec: The Untold Stories, 1916-1971 | By Dr. Alan Pollack. Hotel Lebec: The Untold Stories, 1916-1971. Heritage Junction Dispatch | July-August 2018. The history of Los Angeles is replete with tragic rise-and-fall stories. William Mulholland and the St. Francis Dam disaster. Thaddeus S.C. Lowe and Mount Lowe. Thomas Thorkildsen and the Sterling Borax Mine. 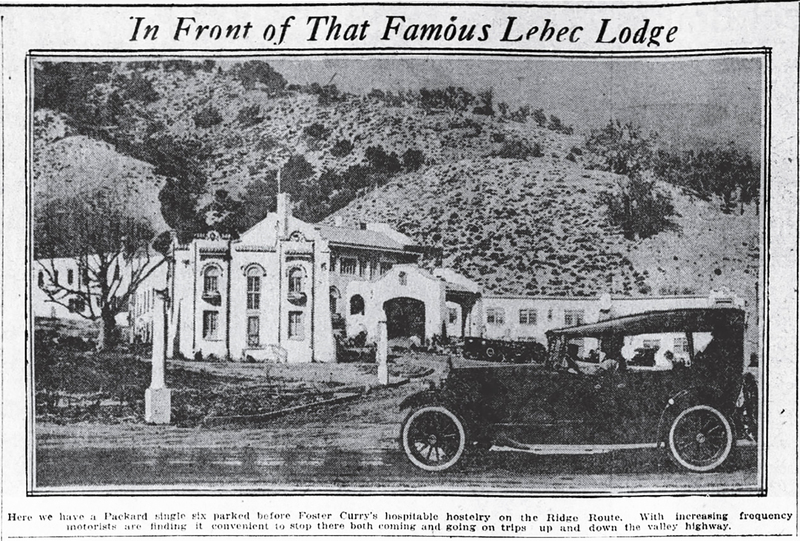 Yet another story involves what some might consider the crown jewel of the heyday of the famous Ridge Route: the Hotel Lebec. At its peak, the opulent hotel, situated between the town of Lebec and Fort Tejon along what is now Interstate 5, was a favorite hangout of Hollywood celebrities such as Clara Bow, Buster Keaton, Clark Gable and Carole Lombard. It would later go through years of decline leading to its deliberate torching in 1971. Bakersfield Californian, 10-2-1917. Click to enlarge. Also this, same date. The story begins with the Ridge Route, a winding road completed in 1915 along the crest of the Tehachapi Mountains, thus becoming the first direct route between Southern and Northern California. 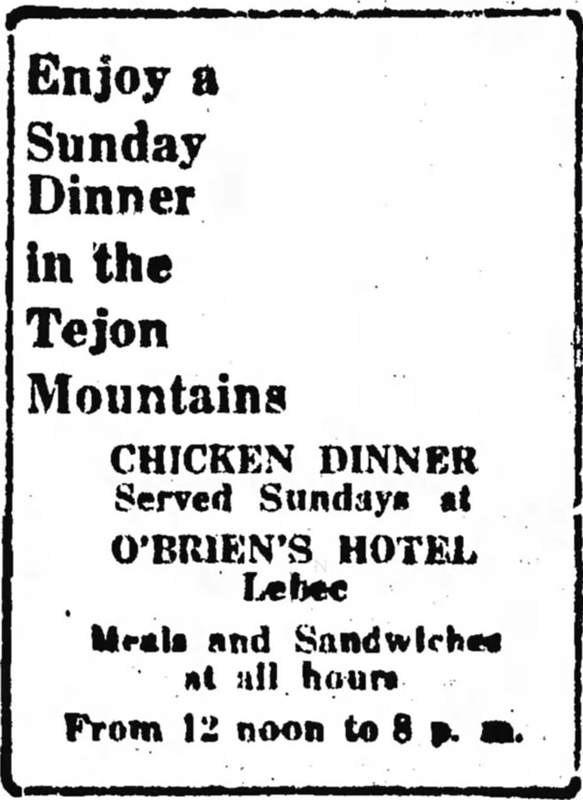 As early as 1916, Bakersfield saloonkeeper Thomas O'Brien had opened a Hotel Lebec and advertised Sunday chicken dinners from noon until 8 p.m. in the local newspapers. L.A. Times, 1-18-1920. Click to enlarge. Hotel Lebec in the Heart of the Tejon. 82 Miles from Los Angeles and 42 miles from Bakersfield. It is situated in the mountains near the old Fort Tejon and in a country ripe with historic lore of the early West. Hunting and fishing may be had here and only a few minutes' hike from the hotel, the real Wild West begins. Being located on the main highway between San Francisco and Los Angeles, it is an ideal place to break a motor journey. Every service is offered. The hotel is noted for its mountain dinners, and people come from miles around for the special Sunday spread. There are individual cottages, equipped for day and night service. A large modern garage is operated in conjunction with the hotel where the motor tourist may have every want supplied. In fact, Lebec offers all that is demanded by the 20th-century motor tourist in service, scenery, restful surroundings and a variety of out-door entertainment. An ideal place to spend a week-end. ... The Eldorado stages give perfect service every day. 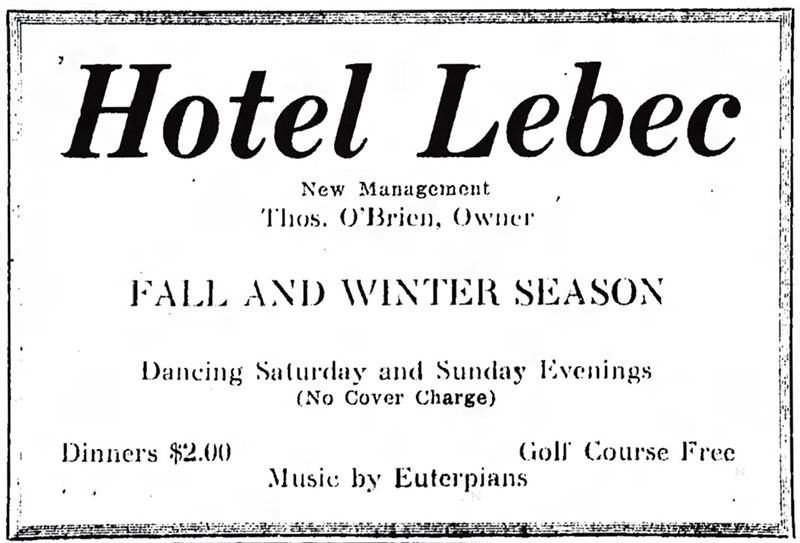 The Los Angeles Times reported (March 27, 1921) on a new Hotel Lebec to be built at a cost of $200,000. It would be "fireproof" and have 100 rooms. It was a joint project financed by automobile heir Russell Clifford "Cliff" Durant and Thomas O'Brien. The original plan called for nearby Lake Castaic (near Lebec, not the one we know in the town of Castaic) to be dammed and improved for boating and fishing, a nearby aviation field, an observatory on a prominence that was allegedly a lookout for mountain man Peter Lebec, who was said to be a "one-time officer in Napoleon's army, who was the first settler in the valley, which he called the 'Valley of the Clouds.'" (In reality, we don't know who Peter Lebec was, other than he's the subject of an inscription on a tree at Fort Tejon stating he was killed by a grizzly bear at that location in 1837). San Francisco Chronicle, 5-8-1921. Click to enlarge. Mr. O'Brien, who owns large acreage around Lebec, has been engaged in farming and stockraising. For years he has been extending his restaurant and hotel accommodations, and the new hotel is the outgrowth of the demand for a comfortable overnight stopping place. It is the intention to create a mountain resort with its own amusements. 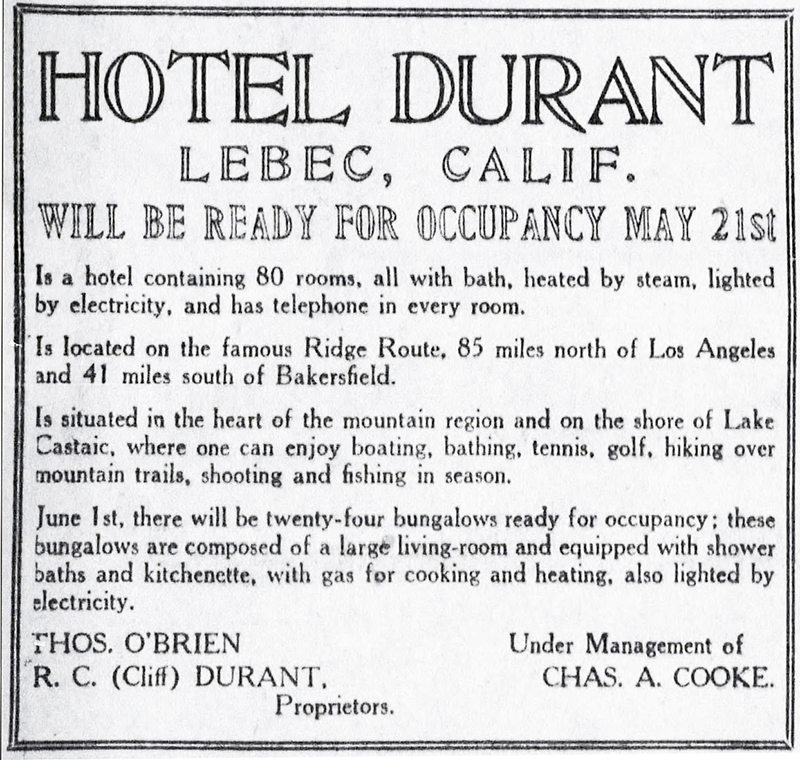 An ad in the L.A. Times on May 8, 1921, announced that the hotel, initially named Hotel Durant, would be ready for occupancy May 21 with "80 rooms, all with bath, heated by steam, lighted by electricity, and has telephone (service) in every room." Twenty-four bungalows with a "large living room, and equipped with shower baths and kitchenette, with gas for cooking and heating, also lighted by electricity" would be ready June 1. The proprietors were listed as O'Brien and Durant with manager Charles A. Cooke at the helm. That same month, Frank Peebles laid out a new nine-hole golf course for the hotel. The greens were temporarily made of sand until water could be piped in. In October 1922, Foster Curry, former manager of Camp Curry in Yosemite Valley, purchased the Durant Hotel from R.C. Durant and later purchased the adjacent general store and garage from O'Brien. 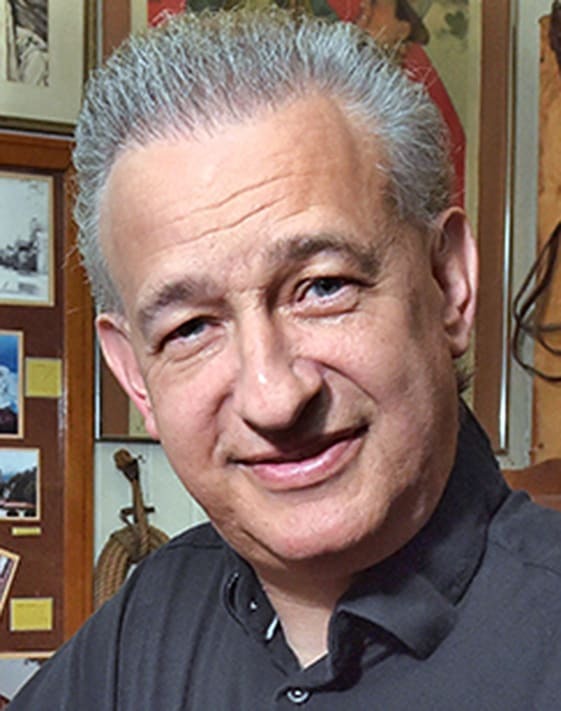 The newly renamed Curry's Lebec Lodge would be run by Curry and Wallace Curtis. Such a stopping place as Foster Curry's Lebec Lodge is one of the best examples of what the automobile has helped to create in the way of fine hotel accommodations along the main highways. 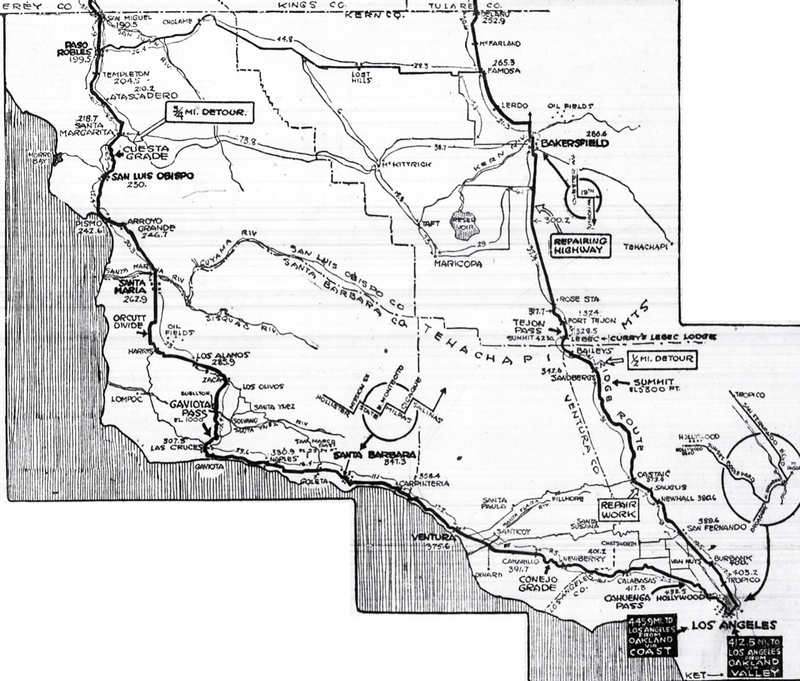 It has become a sort of division point on the Valley Highway for travel between Los Angeles and San Francisco. L.A. Times, 7-1-1923. Click to enlarge. Even in those early days, the hotel suffered through some bad times. A fire swept through the facility November 4, 1923, destroying the garage, restaurant, golf clubhouse and store and a number of houses. The fire was thought to have been caused by an explosion of a stove in the restaurant kitchen and ended up causing up to $60,000 in damages. The 150 guests in the hotel that night had to leave their rooms hastily in scanty clothing in the cold, early-morning hours, and they shivered outside until it was clear the main hotel building would not be consumed by flames. Ironically, an association of insurance adjustors had just left the hotel the day before the fire, after completing a three-day convention. O'Brien remained a co-owner of the hotel along with Curry. This led to a lawsuit between the two in June 1924. O'Brien was trying to sell the hotel due to an allegation of indebtedness. Curry filed suit to get an injunction preventing O'Brien from selling the hotel, claiming all payments on the hotel's mortgage were up to date. O'Brien argued that the payments from Curry were in arrears. Curry eventually sold his portion of the hotel to Jack Wooley, a wealthy former Oakland saloon man, while O'Brien ironically did not sell his half. 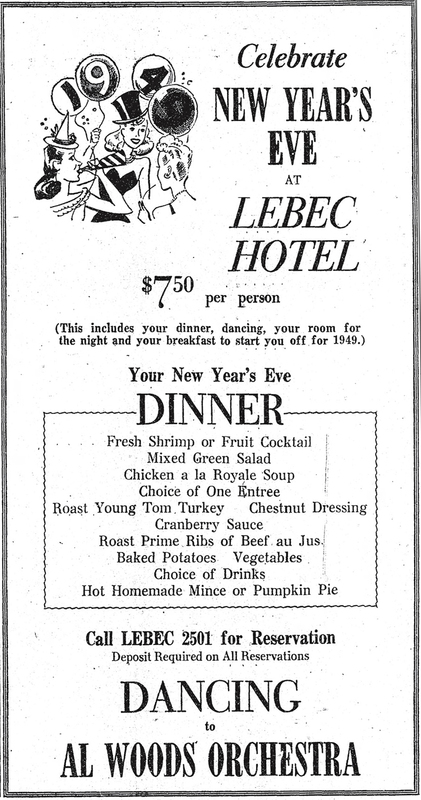 At that time, the hotel was renamed the Hotel Lebec. Curry died of leukemia in 1932. By 1925, the hotel was increasing in popularity. Movie companies were frequently making the hotel the center of their activities, particularly when needing to film mountain scenes. During the filming, the entire cast and crew would stay at the hotel. The advent of alcohol Prohibition in the 1920s led to an incident at the hotel in August 1925. Jack Wooley had a stash of 40 cases of choice pre-war liquor, under a government permit, valued at $5,000. In the early-morning hours of August 22, while Wooley and O'Brien were away in San Francisco, manager James Bryant and his wife were awoken by four heavily armed men claiming to be federal officers and demanding access to the room with the liquor. After threatening to kill Bryant, the hijackers, who turned out not to be federal agents, proceeded immediately to room 101 where they carted off all the liquor and sped off in four high powered touring cars toward Los Angeles. Five days later, Wooley chose to sell his entire portion of the hotel to O'Brien, who became the sole owner. O'Brien held on to the property for another two years before selling the hotel and adjacent 4,400 acres in November 1927 to Louis Bernstein, J.C. Stewart, and Henry Weise of the Sales Development Company of Los Angeles for $400,000. The new owners planned to subdivide the 4,400 acres into mountain cabin sites. O'Brien died at the age of 73 in 1942. Bakersfield Californian, 1-13-1925. Click to enlarge. Another strange incident occurred near the hotel in September 1929. Late in the evening of September 24, Department of Justice agent A.M. Moody went to the home of Frank R. Linden, a laundryman for the Hotel Lebec, to question his 23-year-old niece and foster daughter regarding a white-slave prostitution and gangster ring criminal case. Moody was threatened by Linden, and he called in four deputy sheriffs to assist him. They knocked on Linden's door, demanding admittance to the home. Upon learning that the deputies were from the Bakersfield office, Linden threatened them, swore, and retreated back into the house. Deputies said he was armed with a .45-caliber automatic pistol. Deputy Al Renfro tore a hole in the screen of the front door with his revolver and shot at the retreating Linden. Renfro stepped backward, which another officer, Al Welch, interpreted to mean he had been shot by Linden. Welch let loose at Linden with a shotgun and struck Linden under the left arm. The buckshot penetrated through Linden's heart, and he fell to the floor dead a few seconds later. Subsequent testimony brought to light that Linden had mistakenly thought Moody was a fugitive from justice who had previously threatened to kill his niece. Welch was eventually cleared of all blame in the shooting after an inquest that resulted in a verdict of justifiable homicide in self-defense. 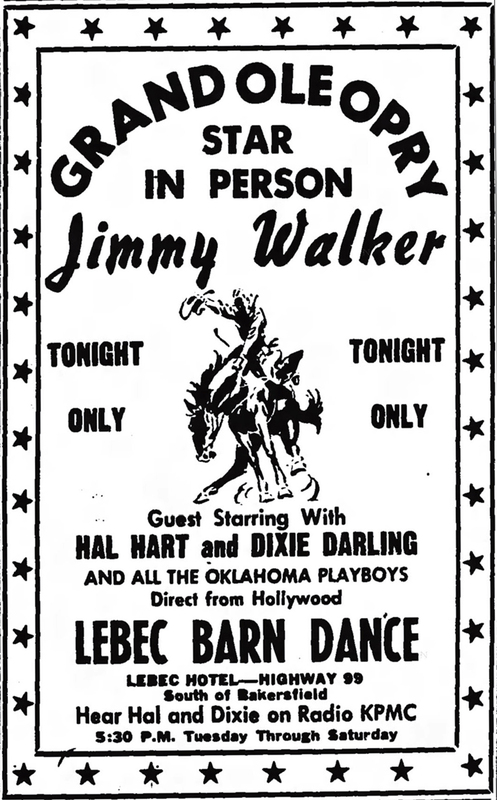 Bakersfield Californian, 12-30-1948. Click to enlarge. Also this from 1950. In the ensuing years, ownership of the hotel continued to change hands. At some point, A.F. Kennedy, representing the Signal Hill Gasoline Company, became the manager and proprietor. He sold the hotel and coffee shop in 1936 to a group of Los Angeles and Pasadena residents operating as the New Lebec Hotel Corporation. The new group included M.C. Kress and Charles F. Hale of Los Angeles, and George O. and Grace G. Relf and their son William F. Relf of Pasadena. Mrs. Relf was the sister of the first wife of Kansas Gov. Alfred Landon, who ran for President against Franklin D. Roosevelt that same year. The purchase price was $79,000 and included 2,000 surrounding acres. Relf sold his interest in the hotel in 1938 to Los Angeles businessmen Alfred W. Wakeman and C.E. Chapman for $100,000. The remaining members of the New Lebec Hotel Corporation held on to the hotel until 1948 when they sold out to Burk Enterprises for $190,000. Mr. and Mrs. Frank C. and Barbara J. Cotter leased the hotel from Harry Burk Jr. in 1953. 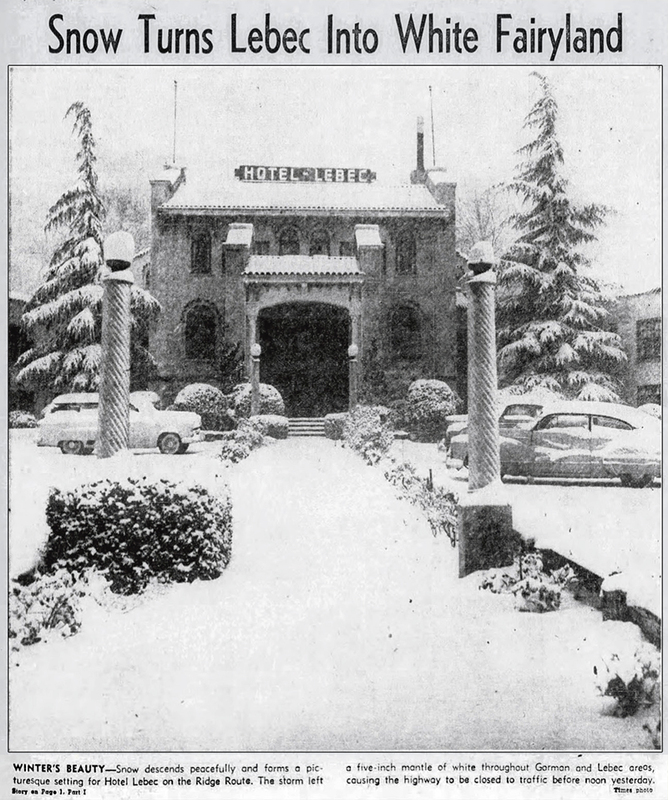 During Burk's ownership, the hotel was used for a gambling operation for 3½ months in the spring and summer of 1953. Around midnight on October 2, 1953, a team of five state agents raided the Lebec Hotel with false membership cards for a casino that was run at the hotel. They were delayed admittance due to doubt over the authenticity of the cards. By the time they reached the second floor casino, all activity had ceased. The dozen or so customers stood foolishly idle in a large room appointed with a roulette table, two crap tables, a blackjack table, and four card tables. The agents were unable to establish use of the equipment. They returned to Bakersfield for a search warrant to confiscate the equipment. When they returned, they found the saloon empty except for a few non-gambling tables and occasional chairs. L.A. Times, 1-7-1955. Click to enlarge. Authorities claimed the casino was run by Burk, Howard Mooney and Max Travis of Long Beach. A spokesman for law enforcement stated the second floor of the hotel was as elaborate as "anything in Vegas." He further described the operation as "an attempt by three Long Beach gamblers to set up an establishment that could be reached by Los Angeles residents but not the Los Angeles police." Burk sold the hotel in 1955 to Al Pearlman of Columbus for $300,000. In July 1956, the Cotters sued Los Angeles for $53,400 in damages, claiming the hotel had decreased in value due to Burk's gambling operation while they were leasing from Burk. They further claimed the casino was run with the permission of the California attorney general's office. Cotter claimed that Burk told him state Attorney General Edmund G. (Pat) Brown and Kern County Sheriff Tom Kelly had "sanctioned gambling" in the hotel, "received a portion of the revenue" and assured him that "no embarrassment would befall" Cotter. Stating "actions speak louder than words," Brown denied Cotter's allegation, pointing to the 1953 raid on the hotel as evidence the state had not cooperated in the gambling operation. The Newhall Signal, 3-3-1971. Click to enlarge. The 1953 raid was led by Harold G. Robinson, then California's deputy director of the Department of Justice. In response to the Cotter suit, Robinson stated that five days before the Cotters signed their lease, a letter had been sent to Burk warning him that the Department of Justice had "heard that he was proposing to violate the penal code at the Lebec Hotel" and that "any violations would be prosecuted." Based on the letter, Burk would be convicted in 1954 of giving the undersheriff of Kern County a $600 bribe. Following the Burk gambling debacle, the Lebec Hotel went into a death spiral of disuse and decline. Attempts to revive the hotel by bringing in big name bands in the 1950s failed. The completion of Interstate 5 contributed to the hotel's demise, as motorists would now pass by the landmark without noticing it. The hotel closed its doors for good in March 1969. By March 1971, the Newhall Signal was holding a photo contest entitled "Beauty and the Blight." First prize was a weekend for two at the beautiful Ahwahnee Hotel in Yosemite Valley. 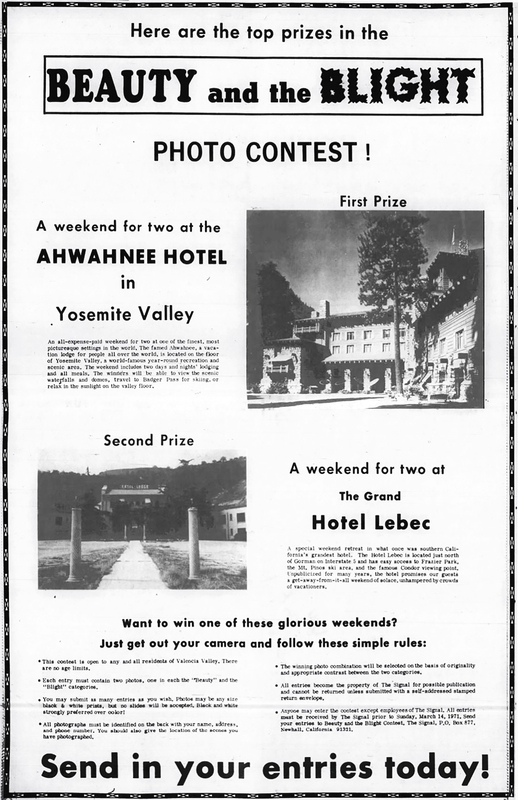 Second prize was a weekend for two at the now blighted Hotel Lebec. The Signal stated: "Unpublicized for many years, the hotel promises our guests a get-away-from-it-all weekend of solace, unhampered by crowds of vacationers." Finally, in April 1971, the Lebec Hotel was condemned by the Kern County Health Department. In response, the hotel was burned to the ground April 27, 1971, by employees of the then-owner of the property, the Tejon Ranch Company. It was truly the end of an era.